Store all of your website URLs and passwords in one encrypted database, use that database on all of your computers. - Defeats keyboard logging viruses. - Allows you to use more complicated, secure passwords. - Keeps all of your websites URL, and website username / password in one convenient place. - Launch your websites from one convenient place. - Use the same program and database on Windows, Macintosh, and Linux computers. - Very simple, no feature bloat. - Available for Windows, Macintosh and Linux computers, use the same database on all three operating systems, on all of your computers. - The main Password Compass database uses ultra secure AES 256 bit encryption. - The key used to encrypt the main database is the Password Compass password, which you define, and store locally in a separate AES 256 encrypted database. - The main Password Compass database is useless without your Password Compass password. 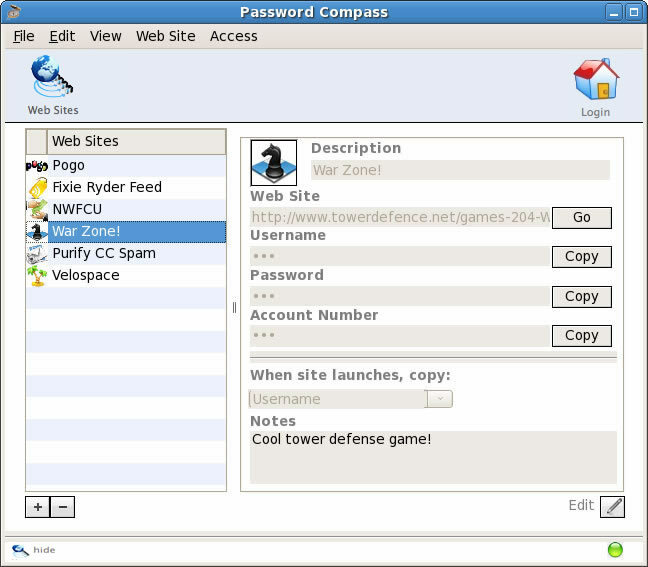 - The main Password Compass database can be securely moved between computers; even between Windows, Macintosh, and Linux computers using the Password Compass import/export feature. 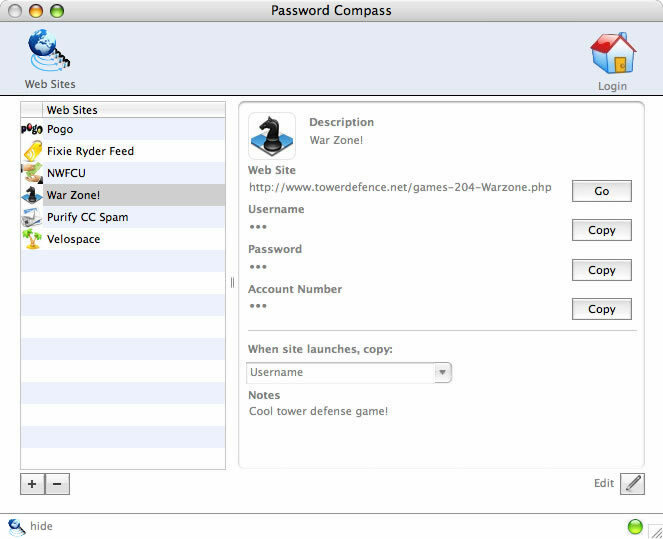 - The same main Password Compass database can be used on your Windows, Macintosh, and Linux computers. - Launches websites defined in Password Compass using your system's default browser with the click of a button. - Automatically copies a user selectable field (username, password, account number) to the clipboard when the website is launched, then you just paste into the appropriate field in your web browser. - Using either a button on the user interface, or a key combination you can copy username, password, account number or security question to the clipboard. - Automatically clears the clipboard entry after 30 seconds. - Login timer can be set to automatically log you out of Password Compass after a user defined period of time, or you can stay logged in to Password Compass indefinitely.